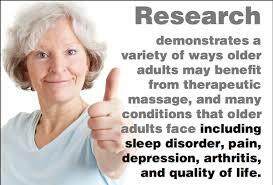 Help yourself get back on your feet with massage and smooth your way through the aging process. We often hear ‘Getting old is not for sissies’ and while I’m sure that’s true, regular massage therapy can help you put a positive spin on your aging process. None of us really want to get old. It’s hard! For those of us who are lucky enough to be growing old, we need to remember that this is a privilege denied to many. More and more we discover that our minds and bodies simply cannot do what they always did but we are also finding more ways to help ourselves combat the obvious effects of aging and feel better about ourselves. If you read my blog regularly then you already know that I am a proponent of simple solutions to health and wellbeing. These include eating moderately and consciously whenever you can, drinking plenty (more than or two glasses per day) of pure water (click here for more information about hydration) exercising regularly in whatever way your body will allow and steering clear of nasty people (you will know them if your stomach tightens, your jaw clenches, your head aches or you feel diminished at the mention of their name). Add to that list getting regular massages! Of course being a massage therapist for the last 28 years, I tend to look at the world through the lens of massage but I have seen so many older adults reap huge benefits from bodywork that I remain a steadfast advocate. If you suffer from any condition that makes it difficult for you to get outside and enjoy the sunshine, (pain, arthritis, poor balance, auto-immune disease and many others) then massage becomes even more important. It can help keep your muscles loose and ready for the activities of daily living, it can reduce inflammation and pain levels, it can aid with sleep and anxiety, it can help prevent injuries from falling and can flush accumulated waste from muscles and organs due to inactivity or medications. Aging can impose many restrictions in our bodies depending on our circumstances and massage is something we can always do for our health and well-being. Many older adults living in Sedona have the time and resources to afford regular massages and you can easily book ahead the same way you do for vacations or doctors appointments. At the beginning of your session I will write a detailed intake, while all you have to do is speak. We talk about what you want from the session and how I think I can help. Then, you undress and get onto the table in private. The table is lowered so it’s easy for you to get on and off. I check in with you often about pressure and pace, warmth on the table and in the room. I hope you will rebook before you leave but you are never pressured to do so. I will often give you tips on how to feel better in between sessions and changes that would help you. The massage that happens in the midst of all this is both unique and personal, according to what you have asked for. You are never too old to try massage for the first time and I would be happy to fill in while your regular massage therapist is sick, on vacation or has left town more permanently. I’m here to help you get back on your feet and smooth your way through the aging process.